← Is it the right time for a $5M Milton CityCat stop? Good summaries of today’s ABS Labour Force data are provided by Pete Faulkner (Unemployment rate refuses to rise) and Queensland Treasury (Information brief). This entry was posted in Labour market, Macroeconomy and tagged abs, australia, labourforce, qld, qldtreasury, queensland, unemployment. Bookmark the permalink. The fear of unemployment is a big drag on the economy. While rate of unemployment is 5.8 %, there are many times more who have ‘flowed’ through unemployment, so even if you aren’t unemployed for long it is the experience that matters. Also, the more people who ‘flow’ through unemployment, the more people will know someone in their immediate family or circle who has been unemployed. 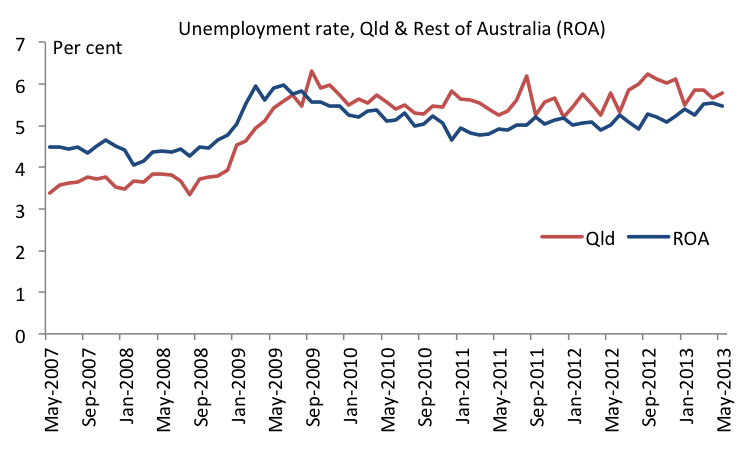 The sharp peaks and troughs in the Qld line indicate a high flow-through in un-employment. Fear of unemployment is a rational reaction, even when the official unemployment rate appears low. There is a very interesting opinion article on the Public understanding of risk in The New Scientist 8 June – Worrying Times. p26 . that addresses this fear f unemployment well. Thank, I’ll have a look at that New Scientist article. I wonder about the rationality of the fear for many people, given the unemployment rate is much lower now than it has been at times over the last few decades. The problem though is that the Queensland participation rate has fallen relatively sharply since the LNP took power in Queensland. A falling participation rate can easily disguise real unemployment by dragging down the unemployment rate by way of shrinking the workforce relative to the size of the working age population. The unemployed are still there, there are just not classified as unemployed. A solidly performing economy should not be seeing significant falls in workforce participation. It would nonetheless be a bit difficult to point the finger entirely at Newman – the massive mining investment boom has peaked and while Queensland was the brighter spot for mining investment compared to WA recently, I suspect that this is probably almost all here in Gladstone (Curtis island). Many of the 9000 strong workforce are FIFO and may well reside outside of Queensland. Government has no control over the duration of mining investment booms so the LNP have come to power at what is likely to be a tougher time to be in government. The government has only made 14 000 redundant (to my knowledge) – my feeling is that over time, these positions will be re-created on a contractual basis. The government will fulfill it’s ideological position of “small government” by officially re-classifying public sector jobs as something else. The taxpayer will continue to pay for the privatised public servants plus the margin of the service companies who actually hire them. Yes, it appears a significant number of people who became redundant left the labour force, possibly as early retirees. Whether they actually desire to be retired yet or not is another question. Yes, it’s possible they may re-enter the labour force at a later date and then show up in unemployment. Question – wouldn’t a lot of them probably be unable to add themselves to the unemployment rate anyway. What I mean is, if say I get the chop……I’m not sure that I’m actually eligable for unemployment benefits since my wife probably earns too much and we have savings etc. You can’t be classified as unemployed if you can’t apply for newstart benefits, even if you are seeking work. Not sure how accurate any of this is, the thought just occurred to me that’s all. What are the restrictions on being able to claim unemployment benefits? The definition of unemployment in the ABS labour force data is unrelated to whether you get unemployment benefits or not. It’s based on whether you’re actively seeking work. Thanks Gene, I should have remembered that. It appears that I put my typing fingers into gear without engaging my brain first.